Website owners like to think that their business is all online. But that fails to take into account that human beings live in the “real world” not the virtual one. Over in the “real world” people still like talking to each other, meeting up with each other and doing business face-to-face. It is rather like the notion of the “paperless office”. Thirty years ago when desktop computers were being introduced into the office, people were claiming it would lead to a business world without paper. Since that time, sales of office paper have rocketed and there are few offices that do not have printers near each desk. The computer did not herald the arrival of a paperless office at all. With the arrival of the web and email, a similar prediction was made – that we’d all be doing business virtually, rather than meeting up in the real world. In reality, things like social media platforms have triggered more meetings. Indeed, without arranging meetings in the real world through Facebook, Eventbrite or Meetup, for instance, there would be far fewer coffee shops than is now the case. Indeed, as the use of the Internet has risen so has the number of coffee shops. Could there be a connection? What the Internet does is help facilitate more real world business than before. Yet many website owners persist in the view that they can rid themselves of this time-consuming real world activity and do everything at supposedly lower cost in the virtual world. Perhaps new research from Invoca will change their mind. This study shows that one of the main reasons people look up a website is to find the phone number of the business. 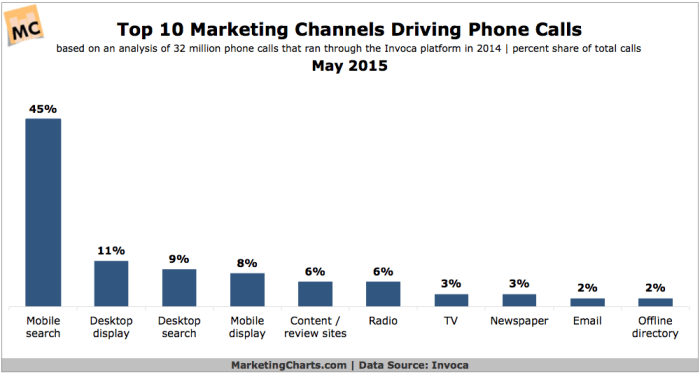 Indeed, 45% of calls appear to come immediately after a search on a mobile device. Clearly, people with a phone in their hand are more likely to want a phone number than anything else. Interestingly, though, the phone calls made after searching for a website on a mobile phone are only about half the length of phone calls made when someone is not mobile. Also, what was interesting in the research on desktop search was that many people are looking for a map or directions to the company. In other words, whether it is a desktop search or a mobile phone search for a business, the focus was very much on engaging in the real world. It seems that website owners are missing a trick if they do not emphasise their real world presence. Your mobile site should have the phone number as its most prominent feature and your desktop site should have clear labelling for a map and directions. Far from using the web to divert customers away from the real world to the virtual one, we ought to be using the Internet to drive more people to our real world business.